Hasbro sent me the FURREAL FRIENDS®: Get Up & Go-Go, My Walkin' Pup™ to review for free. My daughter is almost 5 and has a neighborhood full of friends her age she plays with outside nearly every day. I expected her to drag the toy out each afternoon and share it with all her friends, walking it around the block, pretending to feed it and telling it to sit and stay. The first time she played with the dog, she quickly figured out how he works, getting him to walk and sit. After I loaded it onto my phone, she also played quite a bit with the FURREAL FRIENDS iPhone app. One neighborhood kid came by and joined the fun, but they quickly began to argue over the dog and sharing issues, which we've never had with her friends before. For a short time, they worked it out with one walking and the other sticking twigs in the dogs mouth like a bone. I thought the sharing issues meant my daughter wanted more time with her dog, but after that first day, she really hasn't shown any interest in it or the app. Her friend comes by nearly every day asking to play with it and to borrow my phone, so I gave a coupon to her mom to get it for her birthday. If she doesn't get one, I might pass ours along as a gift since my daughter has no interest in playing with it now. Since my daughter has been in love with her Violet for four years (goes everywhere with us) and a simple stuffed dachshund, I assume each kid has his or her own preferences. The dog is cute and works well. It's a nice size and not too heavy to pick up. It moves along the sidewalk easily and doesn't scare our real pets. However, there's not much to do with it. It walks, barks and whines a bit, and sits but I can't figure out if there's anything else that makes it more engaging. My daughter would rather play with her regular stuffed dogs than the FURREAL FRIENDS®: Get Up & Go-Go, My Walkin' Pup. That said, given how our neighbor absolutely loves it, I wonder if it's an age thing, or just that some kids will love it and others just won't. Our daughter happens to have no interest in it. One thing I need to say that absolutely irritates me is the name of this dog. I know it's hard to come up with unique trademarkable product names, but this is way too long, and way too hard to remember. If I want to tell someone about the toy, I'm definitely not going to walk up and say, "Hey have you seen the new "furreal friends get up and go go my walking pup," lol. 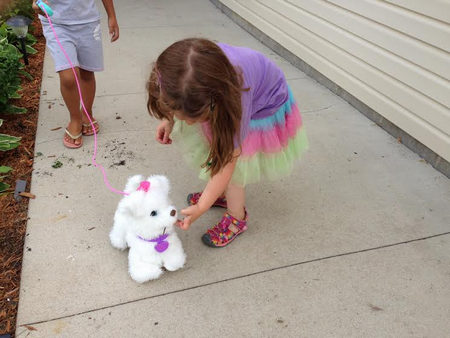 It's a fluffy toy dog that moves on a fake leash. Companies need to get smarter about product names because sharing online sometimes has its limits too - like wasting all my available characters on a product name if I mention on Twitter. My two cents. When my daughter transitioned to "big kid school" this fall, I bought her a personalized lunch bag from Pottery Barn Kids. This was our first time having to send lunch to school, so I wanted her to enjoy carrying the bag and also have it be practical. She's just turning 4, so it was important that she be able to open the bag herself and carry it from the car to the lunch cart without assistance. Pottery Barn Kids offers a slew of fabric patterns and four bag styles. Penny picked the MacKenzie Chocolate Zebra classic lunch bag, which is a fairly standard size and shape lunch box. We paid $7 to have her name embroidered on the bag, which I figured was worth the price to ensure her box isn't mixed up with another kid's lunch. I let Penny pick the font and thread color and ordered online. BzzAgent sent me a coupon to try Garnier Olia haircolor and I was super excited to try a new color. Anyone who knows me knows that I've been coloring my hair since I was 13 years old. I've tried many shades from bright blue, purple, and fire engine red to pricey complex process salon dye jobs. I've stuck to mostly brown shades for the past couple of years and wanted a change. Most of my adult life, I've used either reddish tint or bolder rusty reds, so it seemed like a fun idea to go back to that for a while. Honestly, it was a little challenging to pick a shade I wanted to try because my experience with box color "light" and "medium" seems different from the example photos on Olia boxes. The brown and red shades look darker than what I would call "light," for example. I've been using Olay Regenerist DNA Superstructure UV Cream for years now. I love the SPF 25 (it's now 30) the thick moisturizing quality, and how fresh my skin feels once it's absorbed. It's really thick, so it tends to need more time before I put on foundation, and it does leave my skin a touch lighter than it is in real life. The sunscreen ingredients mean this moisturizer smells just like traditional sun protection, and even a bit like my daughter's diaper cream (ick), but I know it's doing it's job and I've been really happy with it. I intended to buy some more during a trip to Walmart today, but L'Oreal RevitaLift Triple Power Day Lotion had a $2 off coupon attached, and the base price was less than the Olay product, so I took a chance and bought the RevitaLift instead.